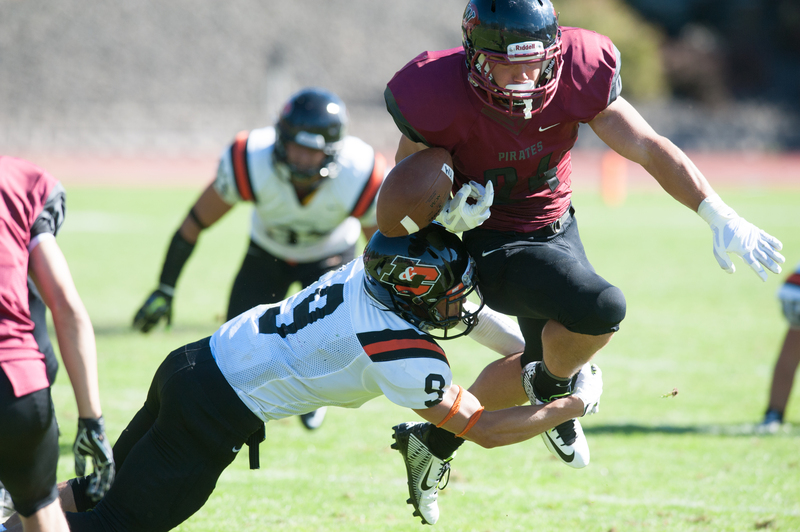 Saturday: Whitworth Pirates (2-0, 1-0 Northwest) at La Verne Leopards (1-0), 12:30 p.m. The Whitworth Pirates took their pass-happy offense on the road last week and stubbed their toes with seven dropped passes, nine penalties and several missed tackles but found a way to beat Whittier 30-17. While the performance gave all the coaches areas to focus on this week in practice, one coach in particular remained all smiles. Offensive line coach Matt Miethe said the win was his first time as coach that his team didn’t play great and still won. Heck, Miethe – the former Rogers High School head coach – said it was the first time in his coaching career that any of his teams started 2-0 to begin the season. Whitworth (2-0, 1-0 Northwest Conference) crushed Lewis & Clark 63-10 on Sept. 6 and found a way to silence the Poets last week despite the missed assignments and 115-degree temperature on the field at game time. Giving up 33 points to a team that just started its football program has offensive coordinator Alan Stanfield believing that his offense should be able to move the ball. Quarterback Ian Kolste, who threw for 250 yards with two touchdowns and two interceptions against Whittier, hurt his shoulder in the game and hasn’t practiced all week. If Kolste can’t go, the Pirates will go with senior Bryan Peterson, who started the first game and missed practice last week because of bruised ribs. “Bryan’s healthy and Ian is banged up. We’ll see,” Stanfield said. Freshman receiver Garrett McKay of Tacoma, who was leading the team with 169 all-purpose yards, suffered a serious knee injury last week and may be lost for the season. Also questionable with injuries were starting receiver Anthony Fullman, who took a helmet to the lower back at Whittier and didn’t practice this week. Others nursing injuries were defensive end Nick Spagnola and tight end Zach Fairhart. Eleven Pirates have at least two catches in the two games with senior Connor Williams leading with 10 grabs. Led by running backs Duke Degaetano (99 yards on 22 carries) and Griffin Hare (Gonzaga Prep) the Pirates are averaging 2.9 yards per run. “That’s got to be better,” Stanfield said. Head coach Rod Sandberg said his team needs to play smarter. Three times last week the defense had the Poets stopped on third-down attempts only to commit personal fouls that allowed drives to continue. Last year, the Leopards jumped out to a 17-0 lead before Whitworth fought back. The Pirates eventually lost 25-20 in the Pine Bowl. Published: Sept. 18, 2014, 4:45 p.m.